At a time when science fiction films about aliens were all about all conquering warmongering fiends from outer space or those from above warning us about our own warmongering fiendish ways, comes a very different take on the sci-fi genre of alien visitors and one that maybe more true to life than had been done before. Jack Arnold’s film starts with John Putnam (Richard Carlson – The Magnetic Monster and Creature from the Black Lagoon), a writer and amateur astronomer, living out in the desert outside the small town of Sand Rock, Arizona. After an evening of wining and dining with his girlfriend and schoolteacher, Ellen Fields (Barbara Rush – When Worlds Collide) at home, the pair adjourn to John’s large telescope for some post evening stargazing, only to witness what looks like a meteor racing across the night sky and crashing into the desert nearby. Eager to see the crash site, John manages to rustle up a helicopter and pilot from nowhere at midnight and heads out to crater with Ellen in toe. With smoke and steam still streaming from the crater, John is keen to get down into crash site and investigate. Unknown to John we have witnessed what might be in wait for him when he reaches the floor of the crater. A strange spherical object with a honeycomb pattern across its surface, a hatch opens and an alien eye appears. Once down on the floor of the crater, John discovers the crashed spaceship for himself. However, before he can get any closer to the craft a landslide takes place, covering the craft completely. John, managing to escape back to the rim of the crater, tells of what he saw to Ellen and the pilot. Both in disbelief and mock any notion of spaceships and aliens. The sheriff (Charles Drake – Harvey and Valley of the Dolls) also arrives to view the site and laughs off any extraterrestrial nonsense along with a local newspaper man, who’s more than happy to ridicule the amateur stargazer. With the local town’s people, fueled by the headlines in the local paper, John is pointed out as a bit of a loon. However, still convinced by what he has seen is driving back home with Ellen through the desert. As they drive home, the two of them nearly crash into something that moved across the road in front of them. Both shaken, neither managed to see what it was, but both were clear that it wasn’t human. With Ellen, now convinced that there is something to John’s claims, after the brush with something strange in the desert, more odd events start to occur. Reports of a local telephone company’s van going missing along with two employees, Frank Daylon(Joe Sawyer – Brewster’s Millions (1945)) and his assistant George(Russell Johnson – This Island Earth and Attack of the Crab Monsters) along with a number of other disappearances. However, Frank and George are seen walking through the middle of town by John, who chases after them down an alleyway. On finally confronting them, John is warned by what he believes to be two aliens impersonating the telephone employees. He is told by them two to keep away and to not interfere with their plans or harm will come upon those who have disappeared. With the increase in the number of disappearances and the number of strange thefts around the town, the Sheriff is now starting to believe that something is going on up at the crater. John, with the information he has been given by the aliens, tries to persuade the Sheriff not to do anything and to let them be. However, he’s not having any of it and is ready to round up a posse and head out to the crater and confront the menace. Still unaware of the full intentions of the alien visitors, John rushes to the crater ahead of the posse to try and persuade the aliens to let their captives go. But will he get there in time? What do the aliens want with them? What is their plan? Will the posse get their alien? 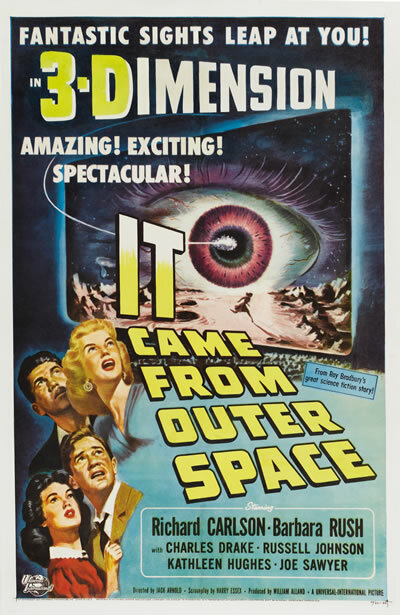 All will be revealed in ‘It Came from Outer Space’. A great little film, with a unique and intelligent take on the well told alien invasion story. Also when final seen the aliens are also a joy to behold, with their totally otherworldly design and realistic view of humans and of space travel and their involvement with in it. Other films of the time might get great recognition, but not many will be as intelligent and as well acted as this one.